Offshore drilling is the most complex and expensive way of accessing oil and gas reserves, particularly when it comes to deep water and ultra-deep water exploration activities. While presenting the industry with its biggest challenges, deep water exploration and development yields the greatest potential rewards and healthy profit margins to the oil service companies involved. The rising complexity and costs of such endeavours demands huge capital investments, long term commitments, higher efficiencies and a growing reliance on technology in order to reduce uncertainties. The market fundamentals for oil service companies remain solid, oil prices are stubbornly holding their ground above $100 per barrel in a tough macroeconomic environment. The resiliency of high oil prices is fuelling increasing exploration and production spending by operators as the industry pushes further offshore into ever-deeper water. By 2020, offshore oil production is expected to account for 34% of the global output up from 25% in 1990. Offshore drilling companies are seeing a significant increase in tenders and requests from customers, particularly for the ultra-deep water rigs which are commanding higher daily rates for its units. The brightening outlook mirrored by record backlog orders and rising rates encouraged the industry to focus on adding new equipment in all market segments in a bid to provide the most versatile fleets of mobile offshore drilling units. Jack-up rigs are mobile, self-elevating drilling platforms that are towed by tugboats to the drill site with water depth of up to 400 feet. Jack-Ups are equipped with tubular structure legs that are lowered to the sea floor where jacking elevates the hull above the water surface before drilling operations begin. Semi-submersible rigs operate in a semi-submerged position with the lower hull ballasted down below the waterline. The rig consists of a deck which contains working areas, equipment and living quarters that is able to carry drilling operations in deep and ultra-deep waters of up to 10,000 feet in water depth. Drill Ships are self-propelled ships equipped for drilling in water depths in which jack-up rigs are incapable of working. They can drill in deep and ultra-deep waters in up to 12,000 feet of water depth. Rising oil prices have also spurred a construction boom in drilling rigs; the cost for a drilling ship easily surpasses $600M per unit where it is leased at $500k/day or more on 2 or 3 year contracts. The Jack-up market is seeing increased demand in Mexico, the North Sea, the Middle East and Asia while the floaters market which includes ultra-deep water rigs has been improving markedly in Brazil, Africa and the Gulf of Mexico. It’s one of the hottest picks in the OGIB portfolio… A company operating in the heart of one of North America’s fastest-growing shale oil plays — with major short-term gain potential. And in my newest research, I explain how recent drill success could see this company’s production more than double AND “slingshot” its valuation. Follow this link to get it. On top of strong oil prices, successful exploration drilling results continue to be reported. Last year, 23 discoveries were announced in 12 different countries in an average water depth of 6,200 feet representing the sixth consecutive year of 20+ announced discoveries. Successful exploration results pave the way for development drilling over the coming years which is another factor in driving future demand. For instance, Petrobras (a Brazilian semi-public multinational energy company) will be renting 26 rigs for the next 15 years in order to develop its deep water oil field discovered back in 2006. The oildfield known as Tupi holds an estimated 8 billion barrels of light sweet oil. In contrast to Brazil’s newly discovered deep water prospects, the Gulf of Mexico is an established deepwater region which is also seeing rising activity levels. The industry expects drilling activity to reach and surpass the pre-Macondo level of about 30 wells by early 2013. Ultra-deepwater rig demand is expected to increase dramatically through 2016 as exploration activity drives future development demand growth. 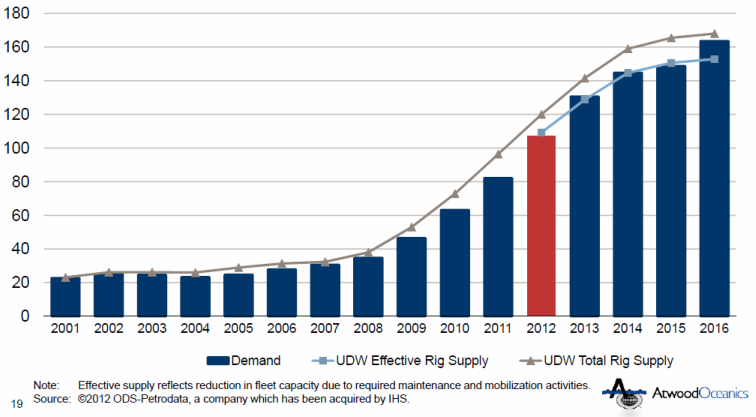 Even with the construction boom, the ultra-deepwater utilization is expected to remain tight in the coming years. Finally, there’s no free lunch as investing in any sector carries its risks. For offshore drilling companies, you’ll want to keep in mind every operator faces risks ranging from storm damage to volatile commodity prices. Offshore drilling accidents, while rare, may result in significant damage or a total loss of a rig. Capital budgets set by E&P companies are dependent on commodity prices; a sharp drop in oil prices will result in an oversupply of drill rigs on the market as capital budgets are scaled down. These companies usually borrow in order to finance construction of new rigs – What happens if prices collapse and contracts are renewed at much lower day rates? Can the company afford to service its debt? For dividend paying companies, future dividends depend on 3 variables of paramount importance: the business outlook, the debt leverage and the contract coverage. Used for ocean, lake and swamp drilling. Bottom of the rigs are submerged to the sea's floor and the platform is on top of the water.